If you’re going to Costa Rica in September or October the answer to the question “where’s the best place to go?” is pretty obvious – head east to the southern Caribbean beaches. The first half of November is pretty solidly in the same pattern. Occasionally the later part of the month clears off and dry season weather arrives early. Unless you’re quite dedicated (or follow our advice above and head to the southern Caribbean) September and October aren’t the best months for wildlife watching. 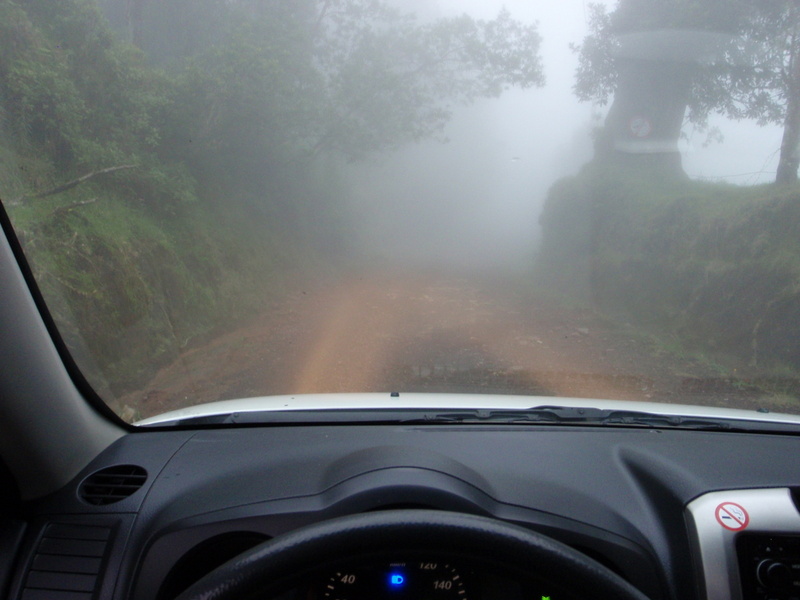 Driving through the cloud forest Volcan Barva, visibility approximately 30 feet. In the central mountain and volcanic ranges and on the coasts of Guanacaste, the Nicoya Peninsula, the central Pacific and the Osa these are the wettest months of the year and the wildlife tends to hunker down during storms. People are usually less enthusiastic about being outside while it’s raining as well which reduces their chances of seeing animals. There’s no quetzal nesting activity in the cloud forests of Monteverde and the Pacific Green sea turtles and Leather-back turtles don’t begin nesting until November. Most of the winter migrant birds from the U.S. and Canada won’t arrive until at least November and most of the South American migrants have already headed home. There are a couple of bright spots on the Pacific side wildlife calendar though. 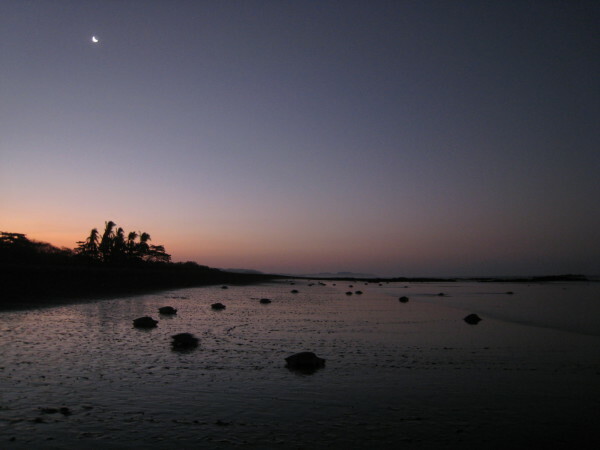 Olive Ridley sea turtle arribadas are at their largest with mass nesting peaks around 9/13, 10/12, and 11/9/2015. However, keep in mind it can be difficult or impossible to reach playa Ostional due to flooded rivers. The Antarctic population of humpback whales that arrived and calved in July and August are introducing their babies to the warm waters of the Golfo Dulce and central and southern Pacific around Playa Uvita and the Osa before starting the migration back November. Another caveat though, the water can be extremely rough and boat travel is not always advisable. Frogs, and their predators (snakes) love the wet and in areas like Manuel Antionio where you might be lucky to see one or two in the dry season you might find dozens or even hundreds when it rains. The Caribbean fares much better in September and October. National parks like Cahuita and wildlife refuges like Gandoca Manzanillo have very similar species to some of their more famous cousins on the Pacific side and they’re all out lounging in the sun this time of year. The Atlantic Green Sea turtles are nesting in Tortuguero through October and the calm water means great snorkeling on the famous reefs. Low season is low season for a reason – as noted above the wildlife is making itself scarce in many of the popular destinations. Although Canopy zip-lines run rain or shine the white water rafting, canyoneering and waterfall rappelling tours may cancelled at times due to unsafe high water levels. Sailing tours are impacted by rough seas and big waves which, along with heavily silted runoff tends to reduce visibility for snorkeling and scuba diving on the Pacific. Walking on guided nature hikes, hanging bridge canopy tours, trails, treks and especially camping are wet and muddy. One of the best things to do in September, October and November is sit in a volcanic hot spring in the cooler weather. One note for nature enthusiasts though, you should probably stick with the developed resort and spa springs since the back country natural springs are often overwhelmed by cold water runoff and not all that warm. Surfing on the Pacific can be good this time of year as well. There’s a mix of northern swells (earlier and better for the Nicoya) and southern swells (later and better for the central and southern Pacific) reaching the shores. Another thing that every surfer will love is having big fat sets all to themselves. There are no crowds. There are three excellent reasons to consider traveling to Costa Rica this time of year. One is the southern Caribbean which has beautiful weather. The second is that you’ll more or less have the rest of the country to yourself. And finally, it’s cheaper. Even on the Pacific it doesn’t always rain all the time and we’ve had some wonderful experiences in Costa Rica in the fall. Sure all the roads may wash out and you might be stranded but hey that’s why then call it an adventure.